After an accident, a heartsick mom battles depression and guilt, while a shy but determined teenager fights the harsh physical challenges of quadriplegia. Fourteen-year-old Beth believes everything will be okay. Cindy is certain that nothing will ever be okay again. 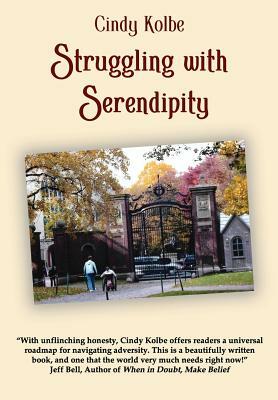 Struggling with Serendipity explores the power of hope while navigating unknown waters of disability. Cindy confronts her altered identity and mental health. Beth sets impossible goals as she tries to swim with legs that don't work and hands that can't cup the water. Together they find a new normal, with serendipity in the most unlikely of moments. Waves of adventure follow, including Beth's invitation to join the Harvard Women's Swimming and Diving team--the first with a visible disability.